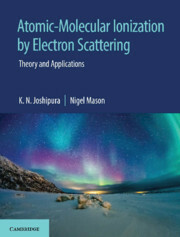 Comprehensive and up-to-date text in the field of electron scattering and ionization, covering fundamentals, experimental background, quantum scattering theories and applications. Electron impact ionization of atoms and molecules in ground/metastable states is discussed comprehensively. The text covers electron scattering phenomena for diatomic and common molecules, polyatomic molecules and radicals including hydro-carbons, fluoro-carbons and other larger molecules together with relevant radical species in detail. Applications of electron impact ionization and excitation in gaseous or plasma and condensed matter is discussed in a separate chapter. Recent advances in the field of electron molecule scattering and ionization for polyatomic molecules is covered extensively. Preface; Acknowledgement; Dedication; 1. Atoms and molecules as bound quantum systems; 2. Quantum scattering theories; 3. Electron atom scattering and Ionization; 4. Electron molecule scattering and Ionization – I; 5. Electron molecule scattering and Ionization – II; 6. Applications of electron scattering; References; Index. K. N. Joshipura is former Professor and Head, Department of Physics, Sardar Patel University Vallabh Vidyanagar, Gujarat, India. He has taught courses including quantum mechanics, atomic-molecular physics, nuclear physics and mathematical physics at undergraduate and graduate level. He has more than forty years of teaching and research experience and has published more than 130 papers in national and international journals. He has been to University College London (August-October 2001), under the Indo-UK INSA Royal Society London joint award program. He investigated a wide variety of atomic-molecular targets, by developing a method of calculating electron-impact ionization cross section as a dynamic fraction of total scattering cross section. Nigel J. Mason is Professor, Department of Physical Sciences, The Open University, Milton Keynes. His current research includes experimental studies of molecular formation on dust grains in the Interstellar medium and on planetary surfaces as well as electron induced processes in outer-space environments. He has published more than 170 papers in journals of international repute. He has published a book titled Introduction to Environmental Physics (2001). He served as Director of Research, Department of Physics and Astronomy (2003–2009), and Associate Dean for Research, Enterprise and Scholarship, Faculty of Science (2009–2014) at The Open University.